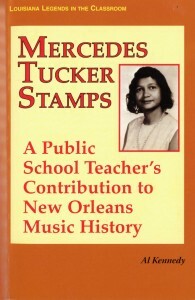 Mercedes Tucker Stamps earned a place in history in 1948 by becoming the New Orleans Public School District’s first itinerant instrumental music teacher serving African American students. During her 30 1/2 years as a public school teacher and her two years at Gilbert Academy, she influenced the lives of thousands of students while preparing talented young musicians for professional careers. Many of the sounds of New Orleans music had their beginnings in Mrs. Stamps’ classroom. piano: music changes lives and unlocks creativity. During her more than three decades in public school classrooms, she prepared her students to become responsible adults through the example she set, and the way she taught them to read, understand, and appreciate music. Al Kennedy’s book, Chord Changes on the Chalkboard: How Public School Teachers Shaped ]azz and the Music of New Orleans (Scarecrow Press, 2002), was awarded the Henry Kmen Award for excellence in New Orleans music research by the New Orleans International Music Colloquium in 2003. He also received the Louisiana Jazz Federation’s “Jazztown Award” in 2000 for his contribution to New Orleans’ musical heritage. Kennedy worked as a communications coordinator in the public information office of the New Orleans Public Schools for 21 years, during which time he began a series of interviews with retired teachers, principals, and superintendents. In 1982, he initiated the effort to establish the Orleans Parish School Board Collection in the Earl K. Long Library at the University of New Orleans (UNO), a collection that has grown to more than 850 linear feet. Kennedy (Ph.D. in Urban Studies, UNO) has conducted additional research that focuses on the lives of music teachers who taught in the city’s public schools and on the history of public education in New Orleans through UNO’s Ethel and Herman L. Midlo International Center for New Orleans Studies. He has taught at Dillard University and currently teaches American History at UNO.